Feast-sized challengeCommit to eat only locally and sustainably produced food during the week. To take this challenge really will underline our issues of food security, but hope provoke great innovation and be lots of fun. I have started a group “Food Care NT” that folks up for the challenge can join. This is affiliated with the group Food Care, which holds local food get togethers and backyard workshops in Darwin to let people share ideas. this group will be holding workshops, before the week to get ready and share ideas to stock pile and make ingredients- like coconut oil and home grown mung beans and after the event to swap experiences and recipes. The challenge is at various levels, if you don’t fancy the extreme, go for bite sized, and if you fancy the workshops contact foodcaredarwin@gmail.com and write about what you are thinking of doing here!! 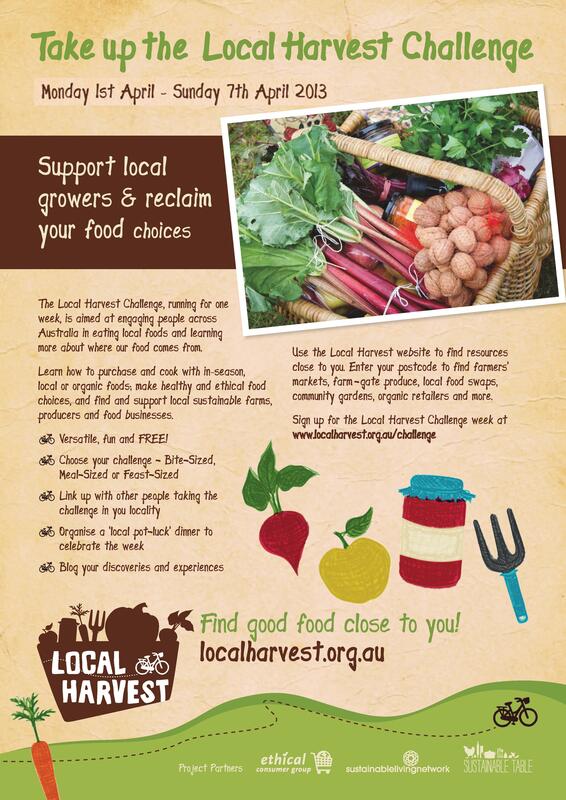 So this week is the local food challenge, and a few if us in Darwin have signed up (or not and are doing it anyway) and we are challenging ourselves to eat more local food than ever. For some, like Jon, that is all of his Fresh Fruit and veggies are from less than 100 miles away (100 mile trial), others are just trying a local ingredient into each meal, and Dan is trying to eat all fresh food from walking distance away! Pretty impressive. Muni, Kate and I have gone for the ultimate challenge, as if marooned on a 100km island incorporating Darwin and surrounds! You never know this could happen one day and we will be the survivalists! So no food will be eaten from further away this week, as a test of what the area has on offer and our creative culinary skills. Now this may sound pretty simple coming from us local food lovers, and most, well over 50% of our veggies and fresh food at this time of year are from our gardens or the market- but there are some things that are pretty tricky. To be honest July to September is the best time for produce, with the addition of all the Mediterranean veggies like tomatoes and zucchini, but hey it is supposed to be a “challenge” In Darwin there is no abattoir, so only home kill chicken or whatever is found around in that sense and sadly Beatrice Buffalo amazing cheeses are not being produced right now, as she is giving the buffalos a rest- so no dairy either! I love grains, lentils, quinoa, cous cous, brown rice and use flour to make doughs and sometimes pasta- but none of those are produced within 100 miles (more like 2500 miles- Tassie/ South Australia). There is wild rice, but it would take a lot to make a meal. So- what about seeds and nuts, I love a sprinkle of muesli on my fruit, or nuts and seeds in salads. But no, they are from far too. No sesame seeds in the stir fry! No soy sauce even. Uh oh! And black tea and coffee, I haven’t seen that growing around here or chocolate. I bet we could grow cocoa- but don’t know of any!!! Jack fruit nuts are a great source of protein, but right now we have none on our tree, I don’t know anyone with any and there were none at the market…. Yup it brings it all home we are quite remote, and that is beautiful and why living here is so special, we have some amazing bush and incredible landscapes, and we are not at all suggesting we should should sacrifice this for large scale food production (take note Tony Abbot- especially not for export to Asia!!) In small market gardens and our own yards in balance with native plants we can produce some amazing tropical treats- so coming up what can we live on…and yes it involves the amazing staple of the islands- the coconut! !